Compliant with TileLink specification 1.7.1. Supports TileLink Master and TileLink Slave. Supports TileLink Uncached Lightweight (TL-UL), TileLink uncached Heavy weight (TL-UH) and TileLink Cached (TL-C) conformance levels. Supports all flow control rules. Supports masking and byte lanes. Slave and Master support fine grain control of response per address or per transaction. Programmable wait states or delay insertion on different channels. Supports all protocol transfer types. Notifies the testbench of significant events such as transactions, timings and protocol violations. Supports Callbacks in Master and Slave for various events. Compatible with testbench writing using SmartDV VIP's. All UVM sequences/testcases written with VIP can be reused. Runs in every major emulators environment. 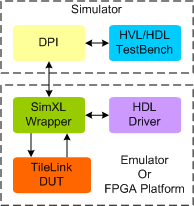 Runs in custom FPGA platforms.